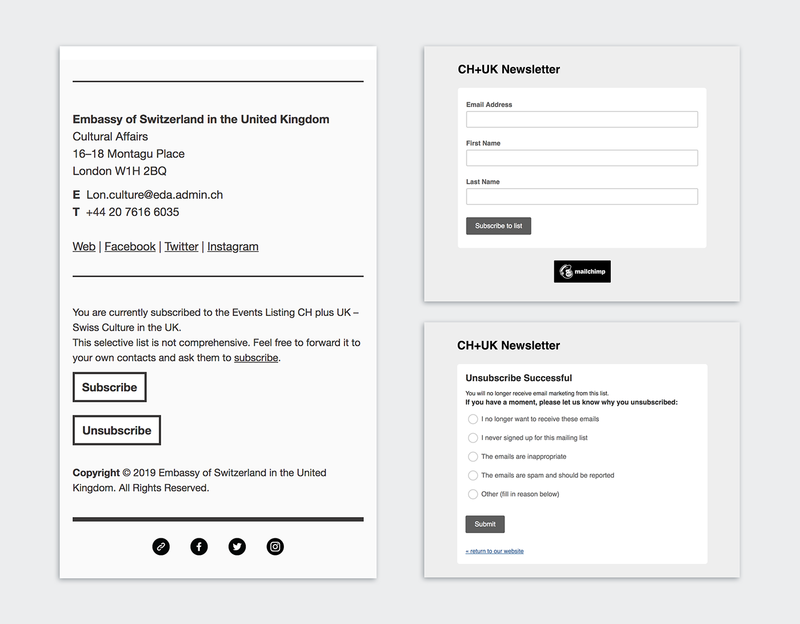 Problem: CH+UK's release a monthly newsletter consisting of details about cultural events throughout the UK, by Swiss creatives. They required a redesign that was slick and minimal but easy to populate themselves. Solution: A MailChimp newsletter template that uses minimal colour and typography, with an emphasis on image. Each listing has a clear call to action, which links to the venue's websites for further information and ticket purchasing. The new footer is now reduced and is GDPR compliant – with a subscribers list that manages itself through MailChimp. Highlights: The challenge of working around the design restrictions of using MailChimp's templates to create a result that is well designed and can be used by the client.